GREAT MILES 33,710! Heated Seats, NAV, Onboard Communications System, Keyless Start, Smart Device Integration, iPod/MP3 Input CLICK NOW! KEY FEATURES INCLUDE Navigation, Heated Driver Seat, Satellite Radio, iPod/MP3 Input, Onboard Communications System, Keyless Start, Smart Device Integration, Heated Seats. BMW i3 with Capparis White/BMW i Frozen Bl exterior and Mega (Sensatec and Cloth) interior features a Electric Motor with 170 HP at 4800 RPM*. OPTION PACKAGES WHEELS: 20 X 5.0 FRONT/20 X 5.5 RR DOUBLE SPOKE Sport BMW i light alloy, Style 430, Tires: P155/60R20 Front & P175/55R20 Rear Mixed tires. Rear Spoiler, MP3 Player, Keyless Entry, Remote Trunk Release, Steering Wheel Controls. EXPERTS REPORT Edmunds.com's review says With its 170-horsepower electric motor driving the rear wheels, the i3 can scoot to 60 mph in 6.6 seconds, which is impressively quick for an EV. The i3's relatively light weight and low center of gravity also contribute to nimble handling characteristics and strong braking power.. WHY BUY FROM US Established in 1982, Pacific BMW has grown to become the premier Los Angeles auto dealer in the Southern California region. Throughout our tenure we strive to include the best possible customer service with top-notch repair/maintenance work and comprehensive new and used car, and SUV inventories. Horsepower calculations based on trim engine configuration. Please confirm the accuracy of the included equipment by calling us prior to purchase. GREAT MILES 25,892! FUEL EFFICIENT 35 MPG Hwy/23 MPG City! CD Player, iPod/MP3 Input, Rear Air, Dual Zone A/C, Keyless Start SEE MORE! KEY FEATURES INCLUDE Rear Air, Turbocharged, iPod/MP3 Input, CD Player, Onboard Communications System, Aluminum Wheels, Keyless Start, Dual Zone A/C BMW 328i with Jet Black exterior and Venetian Beige SensaTec interior features a 4 Cylinder Engine with 240 HP at 5000 RPM*. OPTION PACKAGES DRIVER ASSISTANCE PACKAGE Rear View Camera, Park Distance Control, TRANSMISSION: 8-SPEED STEPTRONIC AUTOMATIC (STD), DARK BURL WALNUT WOOD TRIM, POWER FRONT SEATS W/DRIVER SEAT MEMORY (STD). MP3 Player, Keyless Entry, Child Safety Locks, Steering Wheel Controls, Electronic Stability Control. EXPERTS CONCLUDE Edmunds.com's review says Excellent ride and handling balance; powerful and fuel-efficient engines; upscale interior with straightforward controls and spacious seating.. WHO WE ARE Established in 1982, Pacific BMW has grown to become the premier Los Angeles auto dealer in the Southern California region. Throughout our tenure we strive to include the best possible customer service with top-notch repair/maintenance work and comprehensive new and used car, and SUV inventories. Horsepower calculations based on trim engine configuration. Fuel economy calculations based on original manufacturer data for trim engine configuration. Please confirm the accuracy of the included equipment by calling us prior to purchase. CARFAX 1-Owner, GREAT MILES 25,919! EPA 36 MPG Hwy/24 MPG City! Navigation, iPod/MP3 Input, CD Player, Dual Zone A/C, Keyless Start CLICK NOW! KEY FEATURES INCLUDE Rear Air, Turbocharged, iPod/MP3 Input, CD Player, Onboard Communications System, Aluminum Wheels, Keyless Start, Dual Zone A/C BMW 320i with Alpine White exterior and Black SensaTec interior features a 4 Cylinder Engine with 180 HP at 5000 RPM*. OPTION PACKAGES NAVIGATION SYSTEM Remote Services, Advanced Real-Time Traffic Information, BMW Online & BMW Apps, Instrument Cluster w/Extended Contents, DRIVER ASSISTANCE PACKAGE Rear View Camera, Park Distance Control, TRANSMISSION: 8-SPEED AUTOMATIC W/STEPTRONIC (STD). Keyless Entry, Child Safety Locks, Steering Wheel Controls, Heated Mirrors, Electronic Stability Control. EXPERTS RAVE From its sporty driving character to its refined ride and cabin, the 2016 BMW 3 Series is exceptionally well rounded. It's a highly desirable compact luxury sport sedan, and one of our favorites in this class. -Edmunds.com. BUY WITH CONFIDENCE CARFAX 1-Owner VISIT US TODAY Established in 1982, Pacific BMW has grown to become the premier Los Angeles auto dealer in the Southern California region. Throughout our tenure we strive to include the best possible customer service with top-notch repair/maintenance work and comprehensive new and used car, and SUV inventories. Horsepower calculations based on trim engine configuration. Fuel economy calculations based on original manufacturer data for trim engine configuration. Please confirm the accuracy of the included equipment by calling us prior to purchase. CARFAX 1-Owner, LOW MILES - 37,950! FUEL EFFICIENT 35 MPG Hwy/23 MPG City! Navigation, Heated Seats, Moonroof, Turbo Charged CLICK NOW! KEY FEATURES INCLUDE Rear Air, Turbocharged, iPod/MP3 Input, CD Player, Onboard Communications System, Dual Zone A/C. OPTION PACKAGES TECHNOLOGY PACKAGE Head-Up Display, Navigation System w/Touchpad, Remote Services, Advanced Real-Time Traffic Information, BMW Online & BMW Apps, Instrument Cluster w/Extended Contents, PREMIUM PACKAGE Moonroof, Satellite Radio, Comfort Access Keyless Entry, Lumbar Support, LUXURY LINE chrome design elements (bumper accents, air intakes w/line specific design, kidney bars and exhaust pipe finishers), chrome rings around center stack, A/C and radio controls, high-gloss black B-pillar and signature key, Wheels: 18 x 8 Light Alloy Multi-Spoke (Style 416), Tires: P225/45R18 All Season, Luxury Line Aesthetic Elements, Remove Increased Top Speed, Anthracite Wood Trim, Without Lines Designation Outside, Pearl Gloss Chrome Highlight Trim Finishers, DRIVER ASSISTANCE PACKAGE Rear View Camera, Park Distance Control, LIGHTING PACKAGE Xenon Headlights, Adaptive Light Control, HEATED FRONT SEATS, TRANSMISSION: 8-SPEED STEPTRONIC AUTOMATIC (STD), POWER FRONT SEATS W/DRIVER SEAT MEMORY (STD). Steering Wheel Controls, Child Safety Locks, Electronic Stability Control, Heated Mirrors, Electrochromic rearview mirror. SHOP WITH CONFIDENCE CARFAX 1-Owner WHY BUY FROM US Established in 1982, Pacific BMW has grown to become the premier Los Angeles auto dealer in the Southern California region. Throughout our tenure we strive to include the best possible customer service with top-notch repair/maintenance work and comprehensive new and used car, and SUV inventories. Horsepower calculations based on trim engine configuration. Fuel economy calculations based on original manufacturer data for trim engine configuration. Please confirm the accuracy of the included equipment by calling us prior to purchase. CARFAX 1-Owner, GREAT MILES 23,537! Nav System, Heated Seats, Onboard Communications System, iPod/MP3 Input, Smart Device Integration AND MORE! KEY FEATURES INCLUDE Navigation, Heated Driver Seat, Satellite Radio, iPod/MP3 Input, Onboard Communications System, Smart Device Integration, Heated Seats BMW i3 with Mineral Grey w/ BMW i Blue exterior and Giga (Leather and Cloth) interior features a Electric Motor with 170 HP at 4800 RPM*. OPTION PACKAGES GIGA WORLD Universal Garage-Door Opener, Smoker's Package, Giga Leather/Cloth Interior, Wheels: 19 x 5.0 Front & 19 x 5.5 Rear Giga BMW i light alloy Turbine, Style 429, Comfort Access Keyless Entry, WHEELS: 20 X 5.0 FRONT/20 X 5.5 RR DBLE SPOKE Sport BMW i light alloy, Style 430, Tires: P155/60R20 Front & P175/55R20 Rear Mixed tires, PARKING ASSISTANT PACKAGE Rear View Camera, Park Distance Control, Parking Assistant, Park Assistant Package (5DU). Rear Spoiler, MP3 Player, Remote Trunk Release, Steering Wheel Controls, Electronic Stability Control. EXPERTS CONCLUDE Edmunds.com explains Roomy four-person seating; well-made and stylish interior; great outward visibility; versatile cargo area; nimble handling; peppy acceleration.. SHOP WITH CONFIDENCE CARFAX 1-Owner OUR OFFERINGS Established in 1982, Pacific BMW has grown to become the premier Los Angeles auto dealer in the Southern California region. Throughout our tenure we strive to include the best possible customer service with top-notch repair/maintenance work and comprehensive new and used car, and SUV inventories. Horsepower calculations based on trim engine configuration. Please confirm the accuracy of the included equipment by calling us prior to purchase. FUEL EFFICIENT 35 MPG Hwy/23 MPG City! NAV, Sunroof, Heated Seats, Rear Air, iPod/MP3 Input, Dual Zone A/C, CD Player, Turbo AND MORE! KEY FEATURES INCLUDE Rear Air, Turbocharged, iPod/MP3 Input, CD Player, Onboard Communications System, Aluminum Wheels, Dual Zone A/C BMW 328i with Glacier Silver Metallic exterior and Leather Black/Red hghlgt/Stitc interior features a 4 Cylinder Engine with 240 HP at 5000 RPM*. OPTION PACKAGES TECHNOLOGY PACKAGE Head-Up Display, Navigation System, Remote Services, Advanced Real-Time Traffic Information, BMW Online & BMW Apps, Instrument Cluster w/Extended Contents, PREMIUM PACKAGE LED Headlights, Moonroof, Satellite Radio, Comfort Access Keyless Entry, Lumbar Support, DRIVER ASSISTANCE PACKAGE Rear View Camera, Park Distance Control, HEATED FRONT SEATS. Steering Wheel Controls, Child Safety Locks, Electronic Stability Control, Heated Mirrors, Bucket Seats. EXPERTS REPORT Edmunds.com explains From its sporty driving character to its refined ride and cabin, the 2016 BMW 3 Series is exceptionally well rounded. It's a highly desirable compact luxury sport sedan, and one of our favorites in this class.. OUR OFFERINGS Established in 1982, Pacific BMW has grown to become the premier Los Angeles auto dealer in the Southern California region. Throughout our tenure we strive to include the best possible customer service with top-notch repair/maintenance work and comprehensive new and used car, and SUV inventories. Horsepower calculations based on trim engine configuration. Fuel economy calculations based on original manufacturer data for trim engine configuration. Please confirm the accuracy of the included equipment by calling us prior to purchase. CARFAX 1-Owner, GREAT MILES 27,224! EPA 35 MPG Hwy/23 MPG City! Nav System, Heated Seats, Moonroof, Turbo Charged Engine, CD Player CLICK ME! KEY FEATURES INCLUDE Rear Air, Turbocharged, iPod/MP3 Input, CD Player, Onboard Communications System, Dual Zone A/C. OPTION PACKAGES TECHNOLOGY PACKAGE Head-Up Display, Navigation System w/Touchpad, Remote Services, Advanced Real-Time Traffic Information, BMW Online & BMW Apps, Instrument Cluster w/Extended Contents, PREMIUM PACKAGE Moonroof, Satellite Radio, Comfort Access Keyless Entry, Lumbar Support, SPORT LINE black high-gloss design elements (bumper and air intake trim, kidney bars, exhaust pipes, B-pillar and mirror caps), chrome rings around A/C and radio controls, sport instrument cluster and signature key, Sport Line Aesthetic Elements, Wheels: 18 x 8 Light Alloy (Style 397) Double-spoke, Tires: P225/45R18 All Season, Without Lines Designation Outside, Sport Seats, Anthracite Headliner, M Sport Suspension, High-Gloss Black Trim, Black Door Mirror Caps, Matte Coral Red Highlight Trim Finishers, DRIVER ASSISTANCE PACKAGE Rear View Camera, Park Distance Control, LIGHTING PACKAGE Xenon Headlights, Adaptive Light Control, HEATED FRONT SEATS, TRANSMISSION: 8-SPEED STEPTRONIC AUTOMATIC (STD), POWER FRONT SEATS W/DRIVER SEAT MEMORY (STD). Steering Wheel Controls, Child Safety Locks, Electronic Stability Control, Heated Mirrors, Electrochromic rearview mirror. CARFAX 1-Owner WHO WE ARE Established in 1982, Pacific BMW has grown to become the premier Los Angeles auto dealer in the Southern California region. Throughout our tenure we strive to include the best possible customer service with top-notch repair/maintenance work and comprehensive new and used car, and SUV inventories. Horsepower calculations based on trim engine configuration. Fuel economy calculations based on original manufacturer data for trim engine configuration. Please confirm the accuracy of the included equipment by calling us prior to purchase. CARFAX 1-Owner, GREAT MILES 27,615! EPA 35 MPG Hwy/23 MPG City! Moonroof, Nav System, Heated Seats, iPod/MP3 Input, CD Player CLICK NOW! KEY FEATURES INCLUDE Rear Air, Turbocharged, iPod/MP3 Input, CD Player, Onboard Communications System, Aluminum Wheels, Dual Zone A/C. BMW 328i with Mediterranean Blue Metallic exterior and Ven Beige Lthr/Oyster hglght interior features a 4 Cylinder Engine with 240 HP at 5000 RPM*. OPTION PACKAGES PREMIUM PACKAGE LED Headlights, Moonroof, Satellite Radio, Comfort Access Keyless Entry, Lumbar Support, NAVIGATION SYSTEM Remote Services, Advanced Real-Time Traffic Information, BMW Online & BMW Apps, Instrument Cluster w/Extended Contents, HEATED FRONT SEATS. Child Safety Locks, Steering Wheel Controls, Electronic Stability Control, Heated Mirrors, Bucket Seats. VEHICLE REVIEWS Edmunds.com's review says From its sporty driving character to its refined ride and cabin, the 2016 BMW 3 Series is exceptionally well rounded. It's a highly desirable compact luxury sport sedan, and one of our favorites in this class.. PURCHASE WITH CONFIDENCE CARFAX 1-Owner OUR OFFERINGS Established in 1982, Pacific BMW has grown to become the premier Los Angeles auto dealer in the Southern California region. Throughout our tenure we strive to include the best possible customer service with top-notch repair/maintenance work and comprehensive new and used car, and SUV inventories. Horsepower calculations based on trim engine configuration. Fuel economy calculations based on original manufacturer data for trim engine configuration. Please confirm the accuracy of the included equipment by calling us prior to purchase. CARFAX 1-Owner, GREAT MILES 28,768! EPA 35 MPG Hwy/23 MPG City! NAV, Sunroof, Heated Seats, Rear Air, iPod/MP3 Input, Dual Zone A/C SEE MORE! KEY FEATURES INCLUDE Rear Air, Turbocharged, iPod/MP3 Input, CD Player, Onboard Communications System, Aluminum Wheels, Dual Zone A/C BMW 328i with Black Sapphire Metallic exterior and Saddle Brown Dak Lthr + dash interior features a 4 Cylinder Engine with 240 HP at 5000 RPM*. OPTION PACKAGES TECHNOLOGY PACKAGE Head-Up Display, Navigation System, Remote Services, Advanced Real-Time Traffic Information, BMW Online & BMW Apps, Instrument Cluster w/Extended Contents, PREMIUM PACKAGE LED Headlights, Moonroof, Satellite Radio, Comfort Access Keyless Entry, Lumbar Support, DRIVER ASSISTANCE PACKAGE Rear View Camera, Park Distance Control, COLD WEATHER PACKAGE Heated Front Seats, Heated Rear Seats, Heated Steering Wheel. Steering Wheel Controls, Child Safety Locks, Electronic Stability Control, Heated Mirrors, Bucket Seats. EXPERTS REPORT From its sporty driving character to its refined ride and cabin, the 2016 BMW 3 Series is exceptionally well rounded. It's a highly desirable compact luxury sport sedan, and one of our favorites in this class. -Edmunds.com. BUY WITH CONFIDENCE CARFAX 1-Owner WHO WE ARE Established in 1982, Pacific BMW has grown to become the premier Los Angeles auto dealer in the Southern California region. Throughout our tenure we strive to include the best possible customer service with top-notch repair/maintenance work and comprehensive new and used car, and SUV inventories. Horsepower calculations based on trim engine configuration. Fuel economy calculations based on original manufacturer data for trim engine configuration. Please confirm the accuracy of the included equipment by calling us prior to purchase. EPA 35 MPG Hwy/23 MPG City! CARFAX 1-Owner, LOW MILES - 33,264! NAV, Sunroof, iPod/MP3 Input, Rear Air, Keyless Start, CD Player READ MORE! KEY FEATURES INCLUDE Sunroof, Rear Air, Turbocharged, iPod/MP3 Input, CD Player, Onboard Communications System, Keyless Start, Dual Zone A/C BMW 428i with Alpine White exterior and Venetian Beige SensaTec interior features a 4 Cylinder Engine with 240 HP at 5000 RPM*. OPTION PACKAGES NAVIGATION SYSTEM W/TOUCHPAD Remote Services, Advanced Real-Time Traffic Information, BMW Online & BMW Apps, Instrument Cluster w/Extended Contents, DRIVER ASSISTANCE PACKAGE Rear View Camera, Park Distance Control, WHEELS: 18 X 8 LIGHT ALLOY STAR-SPOKE (STYLE 396) Tires: P225/45R18 All Season, DARK BURL WALNUT WOOD INTERIOR TRIM. Keyless Entry, Steering Wheel Controls, Electronic Stability Control, Heated Mirrors, Bucket Seats. VEHICLE REVIEWS . front seats are very supportive and comfortable, and good both for long road trips and spirited driving. There's also an impressive amount of legroom, and enough headroom for average-sized adults in back. Luggage space is generous, even in the convertible. -Edmunds.com. WHO WE ARE Established in 1982, Pacific BMW has grown to become the premier Los Angeles auto dealer in the Southern California region. Throughout our tenure we strive to include the best possible customer service with top-notch repair/maintenance work and comprehensive new and used car, and SUV inventories. Horsepower calculations based on trim engine configuration. Fuel economy calculations based on original manufacturer data for trim engine configuration. Please confirm the accuracy of the included equipment by calling us prior to purchase. CARFAX 1-Owner, ONLY 21,178 Miles! EPA 35 MPG Hwy/23 MPG City! NAV, Sunroof, Heated Seats, Turbo, Rear Air, Dual Zone A/C READ MORE! KEY FEATURES INCLUDE Rear Air, Turbocharged, iPod/MP3 Input, Onboard Communications System, Aluminum Wheels, Dual Zone A/C BMW 328i with Jet Black exterior and Ven Beige Lthr/Oyster hglght interior features a 4 Cylinder Engine with 240 HP at 5000 RPM*. OPTION PACKAGES PREMIUM PACKAGE LED Headlights, Moonroof, Satellite Radio, Comfort Access Keyless Entry, Lumbar Support, NAVIGATION SYSTEM Remote Services, Advanced Real-Time Traffic Information, BMW Online & BMW Apps, Instrument Cluster w/Extended Contents, harman/kardon SURROUND SOUND SYSTEM, HEATED FRONT SEATS, SPORT SEATS (STD). Child Safety Locks, Steering Wheel Controls, Electronic Stability Control, Heated Mirrors, Electrochromic rearview mirror. EXPERTS REPORT Edmunds.com explains From its sporty driving character to its refined ride and cabin, the 2016 BMW 3 Series is exceptionally well rounded. It's a highly desirable compact luxury sport sedan, and one of our favorites in this class.. PURCHASE WITH CONFIDENCE CARFAX 1-Owner OUR OFFERINGS Established in 1982, Pacific BMW has grown to become the premier Los Angeles auto dealer in the Southern California region. Throughout our tenure we strive to include the best possible customer service with top-notch repair/maintenance work and comprehensive new and used car, and SUV inventories. Horsepower calculations based on trim engine configuration. Fuel economy calculations based on original manufacturer data for trim engine configuration. Please confirm the accuracy of the included equipment by calling us prior to purchase. FUEL EFFICIENT 34 MPG Hwy/23 MPG City! Sunroof, CD Player, iPod/MP3 Input, Onboard Communications System, Keyless Start, Rear Air AND MORE! KEY FEATURES INCLUDE Sunroof, Power Liftgate, Rear Air, Turbocharged, iPod/MP3 Input, CD Player, Onboard Communications System, Keyless Start, Dual Zone A/C. BMW 428i with Alpine White exterior and Black SensaTec/Red Stitching interior features a 4 Cylinder Engine with 240 HP at 5000 RPM*. OPTION PACKAGES TRACK HANDLING PACKAGE Adaptive M & Rear Axle Air Suspension, Wheels: 18 x 8.0 Fr & 18 x 8.5 Rr (Style 398), Increased Top Speed Limit, Tires: P225/45R18 Fr & P255/40R18 Rr Mixed Perf Non-run flat, M Sport Brakes, Variable Sport Steering, DRIVER ASSISTANCE PACKAGE Rear View Camera, Park Distance Control. MP3 Player, Remote Trunk Release, Keyless Entry, Steering Wheel Controls, Child Safety Locks. EXPERTS ARE SAYING Dynamic handling; powerful yet fuel-efficient engines; upscale interior with straightforward controls and spacious seating. -Edmunds.com. MORE ABOUT US Established in 1982, Pacific BMW has grown to become the premier Los Angeles auto dealer in the Southern California region. Throughout our tenure we strive to include the best possible customer service with top-notch repair/maintenance work and comprehensive new and used car, and SUV inventories. Horsepower calculations based on trim engine configuration. Fuel economy calculations based on original manufacturer data for trim engine configuration. Please confirm the accuracy of the included equipment by calling us prior to purchase. EPA 35 MPG Hwy/23 MPG City! CARFAX 1-Owner, LOW MILES - 34,321! Heated Seats, Onboard Communications System, CD Player, Turbo READ MORE! KEY FEATURES INCLUDE Turbocharged, iPod/MP3 Input, CD Player, Onboard Communications System, Keyless Start, Dual Zone A/C. BMW 228i with Alpine White exterior and Black SensaTec interior features a 4 Cylinder Engine with 240 HP at 5000 RPM*. OPTION PACKAGES M SPORT PACKAGE Rear Spoiler, Alum Hexagon Trim w/Estoril Blue Matte Highlight, Shadowline Exterior Trim, Aerodynamic Kit, M Sport Suspension, Wheels: 18 x 7.5 Fr & 18 x 8.0 Rr (Style 461M) Double-spoke, Increased Top Speed Limiter, Tires: P225/40R18 Fr & P245/35R18 Rr Mixed Summer Run-flat, M Steering Wheel, M Sport Pkg, DRIVER ASSISTANCE PACKAGE Rear View Camera, Park Distance Control, HEATED FRONT SEATS. MP3 Player, Keyless Entry, Steering Wheel Controls, Heated Mirrors, Electronic Stability Control. EXPERTS REPORT The ultra-supportive sport seats that are now standard on all versions of the 2 Series provide a high degree of adjustability and are comfortable even on long treks. -Edmunds.com. MORE ABOUT US Established in 1982, Pacific BMW has grown to become the premier Los Angeles auto dealer in the Southern California region. Throughout our tenure we strive to include the best possible customer service with top-notch repair/maintenance work and comprehensive new and used car, and SUV inventories. Horsepower calculations based on trim engine configuration. Fuel economy calculations based on original manufacturer data for trim engine configuration. Please confirm the accuracy of the included equipment by calling us prior to purchase. EPA 34 MPG Hwy/23 MPG City! LOW MILES - 33,636! Nav System, Moonroof, CD Player, iPod/MP3 Input, Dual Zone A/C, Keyless Start CLICK ME! KEY FEATURES INCLUDE Navigation, Sunroof, Rear Air, Turbocharged, iPod/MP3 Input, CD Player, Onboard Communications System, Aluminum Wheels, Keyless Start, Dual Zone A/C, Smart Device Integration BMW 528i with Callisto Grey Metallic exterior and Venetian Beige SensaTec interior features a 4 Cylinder Engine with 240 HP at 5000 RPM*. OPTION PACKAGES PARK DISTANCE CONTROL, REAR VIEW CAMERA, TRANSMISSION: 8-SPEED AUTOMATIC W/STEPTRONIC (STD), DARK WOOD TRIM. MP3 Player, Keyless Entry, Steering Wheel Controls, Child Safety Locks, Heated Mirrors. EXPERTS ARE SAYING Edmunds.com explains The 5 Series cabin is attractive and trimmed with consistently high-quality materials, though it's not flashy. Elegant restraint is the name of the game here, and it's a game that BMW has played to perfection for decades.. OUR OFFERINGS Established in 1982, Pacific BMW has grown to become the premier Los Angeles auto dealer in the Southern California region. Throughout our tenure we strive to include the best possible customer service with top-notch repair/maintenance work and comprehensive new and used car, and SUV inventories. Horsepower calculations based on trim engine configuration. Fuel economy calculations based on original manufacturer data for trim engine configuration. Please confirm the accuracy of the included equipment by calling us prior to purchase. ONLY 42,308 Miles! FUEL EFFICIENT 40 MPG Hwy/30 MPG City! Navigation, Moonroof, Heated Seats, All Wheel Drive, Rear Air CLICK ME! KEY FEATURES INCLUDE All Wheel Drive, Rear Air, Turbocharged, Diesel, iPod/MP3 Input, CD Player, Onboard Communications System, Aluminum Wheels, Dual Zone A/C BMW 328d xDrive with Mineral White Metallic exterior and Coral Red Dakota Leather interior features a 4 Cylinder Engine with 180 HP at 4000 RPM*. OPTION PACKAGES TECHNOLOGY PACKAGE Head-Up Display, Navigation System, Remote Services, Advanced Real-Time Traffic Information, BMW Online & BMW Apps, Instrument Cluster w/Extended Contents, PREMIUM PACKAGE LED Headlights, Moonroof, Satellite Radio, Comfort Access Keyless Entry, Lumbar Support, DRIVER ASSISTANCE PACKAGE Rear View Camera, Park Distance Control, COLD WEATHER PACKAGE Heated Front Seats, Heated Rear Seats, Heated Steering Wheel. Steering Wheel Controls, Child Safety Locks, Electronic Stability Control, Heated Mirrors, Bucket Seats. EXPERTS CONCLUDE Edmunds.com explains From its sporty driving character to its refined ride and cabin, the 2016 BMW 3 Series is exceptionally well rounded. It's a highly desirable compact luxury sport sedan, and one of our favorites in this class.. VISIT US TODAY Established in 1982, Pacific BMW has grown to become the premier Los Angeles auto dealer in the Southern California region. Throughout our tenure we strive to include the best possible customer service with top-notch repair/maintenance work and comprehensive new and used car, and SUV inventories. Horsepower calculations based on trim engine configuration. Fuel economy calculations based on original manufacturer data for trim engine configuration. Please confirm the accuracy of the included equipment by calling us prior to purchase. CARFAX 1-Owner, LOW MILES - 32,944! Sunroof, CD Player, iPod/MP3 Input, Onboard Communications System, Keyless Start, Dual Zone A/C CLICK ME! KEY FEATURES INCLUDE Sunroof, Power Liftgate, Rear Air, Turbocharged, iPod/MP3 Input, CD Player, Onboard Communications System, Aluminum Wheels, Keyless Start, Dual Zone A/C BMW 428i with Alpine White exterior and Black SensaTec/Red Stitching interior features a 4 Cylinder Engine with 240 HP at 5000 RPM*. OPTION PACKAGES DRIVER ASSISTANCE PACKAGE Rear View Camera, Park Distance Control. MP3 Player, Keyless Entry, Remote Trunk Release, Child Safety Locks, Steering Wheel Controls. EXPERTS ARE SAYING Edmunds.com's review says Dynamic handling; powerful yet fuel-efficient engines; upscale interior with straightforward controls and spacious seating.. SHOP WITH CONFIDENCE CARFAX 1-Owner VISIT US TODAY Established in 1982, Pacific BMW has grown to become the premier Los Angeles auto dealer in the Southern California region. Throughout our tenure we strive to include the best possible customer service with top-notch repair/maintenance work and comprehensive new and used car, and SUV inventories. Horsepower calculations based on trim engine configuration. Fuel economy calculations based on original manufacturer data for trim engine configuration. Please confirm the accuracy of the included equipment by calling us prior to purchase. FUEL EFFICIENT 34 MPG Hwy/23 MPG City! NAV, Sunroof, CD Player, iPod/MP3 Input, Onboard Communications System, Dual Zone A/C CLICK ME! KEY FEATURES INCLUDE Sunroof, Power Liftgate, Rear Air, Turbocharged, iPod/MP3 Input, CD Player, Onboard Communications System, Aluminum Wheels, Keyless Start, Dual Zone A/C BMW 428i with Mineral Grey Metallic exterior and Coral Red Dakota Leather interior features a 4 Cylinder Engine with 240 HP at 5000 RPM*. OPTION PACKAGES NAVIGATION SYSTEM Remote Services, Advanced Real-Time Traffic Information, BMW Online & BMW Apps, Instrument Cluster w/Extended Contents, DRIVER ASSISTANCE PACKAGE Rear View Camera, Park Distance Control. Keyless Entry, Remote Trunk Release, Child Safety Locks, Steering Wheel Controls, Electronic Stability Control. EXPERTS ARE SAYING Dynamic handling; powerful yet fuel-efficient engines; upscale interior with straightforward controls and spacious seating. -Edmunds.com. MORE ABOUT US Established in 1982, Pacific BMW has grown to become the premier Los Angeles auto dealer in the Southern California region. Throughout our tenure we strive to include the best possible customer service with top-notch repair/maintenance work and comprehensive new and used car, and SUV inventories. Horsepower calculations based on trim engine configuration. Fuel economy calculations based on original manufacturer data for trim engine configuration. Please confirm the accuracy of the included equipment by calling us prior to purchase. LOW MILES - 13,534! Nav System, Heated Seats, Onboard Communications System, Keyless Start, Smart Device Integration, iPod/MP3 Input CLICK ME! KEY FEATURES INCLUDE Navigation, Heated Driver Seat, Satellite Radio, iPod/MP3 Input, Onboard Communications System, Aluminum Wheels, Keyless Start, Smart Device Integration, Heated Seats BMW i3 with Capparis White/BMW i Frozen Bl exterior and Deka Dark Cloth interior features a Electric Motor with 170 HP at 4800 RPM*. OPTION PACKAGES PARKING ASSISTANCE PACKAGE Rear View Camera, Park Distance Control, Parking Assistant, Park Assistant Package (5DU). Rear Spoiler, MP3 Player, Remote Trunk Release, Keyless Entry, Steering Wheel Controls. EXPERTS RAVE You'll rarely engage the smooth, predictable-feeling brake pedal because substantial off-throttle regenerative braking handles most routine stops in a very engaging way. -Edmunds.com. 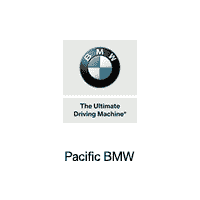 BUY FROM AN AWARD WINNING DEALER Established in 1982, Pacific BMW has grown to become the premier Los Angeles auto dealer in the Southern California region. Throughout our tenure we strive to include the best possible customer service with top-notch repair/maintenance work and comprehensive new and used car, and SUV inventories. Horsepower calculations based on trim engine configuration. Please confirm the accuracy of the included equipment by calling us prior to purchase. FUEL EFFICIENT 33 MPG Hwy/22 MPG City! GREAT MILES 33,281! Navigation, Sunroof, Heated Seats, iPod/MP3 Input, Rear Air, M SPORT SEE MORE! KEY FEATURES INCLUDE Sunroof, Panoramic Roof, All Wheel Drive, Power Liftgate, Rear Air, Turbocharged, iPod/MP3 Input, CD Player, Onboard Communications System, Dual Zone A/C OPTION PACKAGES M SPORT chrome rings around A/C and radio controls, M footrest (not w/beige upholsteries), sport instrument cluster and signature key, Aluminum Hexagon Interior Trim, Shadowline Exterior Trim, Anthracite Headliner, M Sport Pkg, Wheels: 18 x 8 Star-Spoke (Style 400M), Tires: P225/45R18 All Season, Estoril Blue Matte Highlight Trim Finishers, Remove Increased Top Speed, Standard Suspension, Without Lines Designation Outside, Aerodynamic Kit, Sport Seats, M Steering Wheel, TECHNOLOGY PACKAGE Head-Up Display, Navigation System, touchpad, Remote Services, Advanced Real-Time Traffic Information, BMW Online & BMW Apps, Instrument Cluster w/Extended Contents, PREMIUM PACKAGE Satellite Radio, Comfort Access Keyless Entry, Lumbar Support, COLD WEATHER PACKAGE Heated Front Seats, Heated Rear Seats, Heated Steering Wheel, Retractable High-Intensity Headlight Washers, DRIVER ASSISTANCE PACKAGE Rear View Camera, Park Distance Control, DARK BURL WALNUT WOOD TRIM. Rear Spoiler, Steering Wheel Controls, Child Safety Locks, Electronic Stability Control, Heated Mirrors. WHY BUY FROM US Established in 1982, Pacific BMW has grown to become the premier Los Angeles auto dealer in the Southern California region. Throughout our tenure we strive to include the best possible customer service with top-notch repair/maintenance work and comprehensive new and used car, and SUV inventories. Horsepower calculations based on trim engine configuration. Fuel economy calculations based on original manufacturer data for trim engine configuration. Please confirm the accuracy of the included equipment by calling us prior to purchase. LOW MILES - 32,189! FUEL EFFICIENT 34 MPG Hwy/23 MPG City! 428i trim. Navigation, Sunroof, Heated Seats, Power Liftgate, Rear Air. AND MORE! KEY FEATURES INCLUDE Sunroof, Power Liftgate, Rear Air, Turbocharged, iPod/MP3 Input, Onboard Communications System, Aluminum Wheels, Dual Zone A/C. BMW 428i with Mineral Grey Metallic exterior and Ivory White/Blk Dakota Leather interior features a 4 Cylinder Engine with 240 HP at 5000 RPM*. OPTION PACKAGES TECHNOLOGY PACKAGE Head-Up Display, Navigation System, Remote Services, Advanced Real-Time Traffic Information, BMW Online & BMW Apps, Instrument Cluster w/Extended Contents, PREMIUM PACKAGE Satellite Radio, Comfort Access Keyless Entry, Lumbar Support, DRIVER ASSISTANCE PACKAGE Rear View Camera, Park Distance Control, harman/kardon SURROUND SOUND SYSTEM, HEATED FRONT SEATS. Child Safety Locks, Steering Wheel Controls, Electronic Stability Control, Heated Mirrors, Bucket Seats. VEHICLE REVIEWS Edmunds.com's review says Dynamic handling; powerful yet fuel-efficient engines; upscale interior with straightforward controls and spacious seating.. MORE ABOUT US Established in 1982, Pacific BMW has grown to become the premier Los Angeles auto dealer in the Southern California region. Throughout our tenure we strive to include the best possible customer service with top-notch repair/maintenance work and comprehensive new and used car, and SUV inventories. Horsepower calculations based on trim engine configuration. Fuel economy calculations based on original manufacturer data for trim engine configuration. Please confirm the accuracy of the included equipment by calling us prior to purchase.